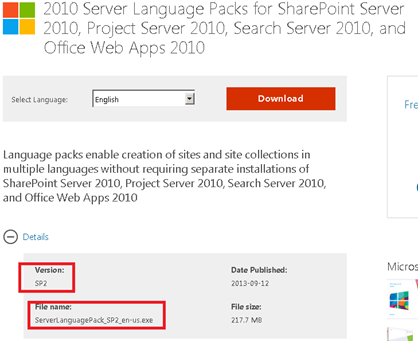 You are here: Home / SharePoint 2010 RTM Language Packs are gone! What do I do now? If you currently have a SharePoint 2010 Environment that is not up to Service Pack 2, you are out of luck since Microsoft pulled the plug on the RTM language packs and replaced them with Language Pack + SP2 ones. In this post we’re going to take a look at how to deploy a new language to a pre-sp2 SharePoint 2010 environment. 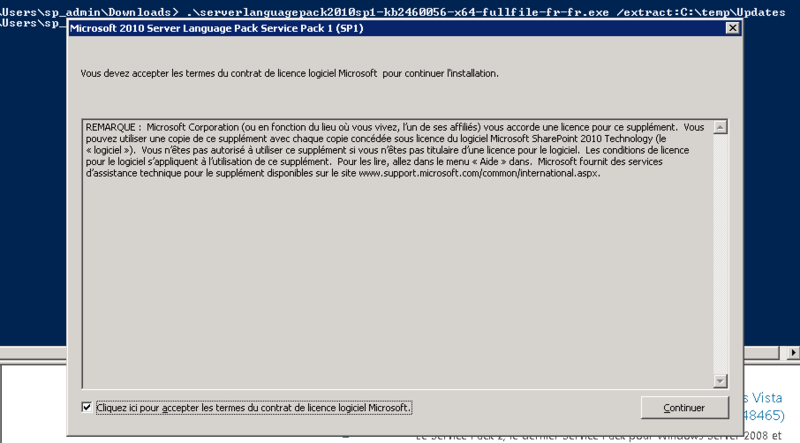 The first thing I tested obviously is install the language pack on a SharePoint 2010 that is only patched up to Service Pack 1…and to my surprise… it actually worked and the Configuration Wizard didn’t give me any “version mismatch” errors. However, when you look at the patch levels you realize that it’s way off. 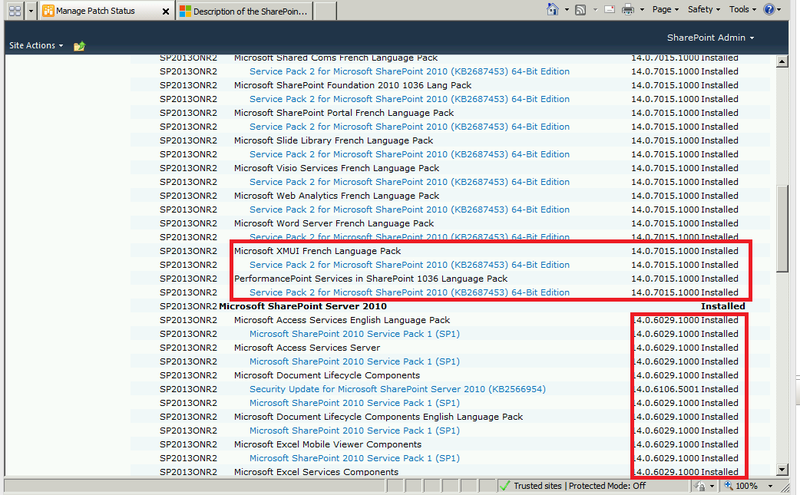 The Language Pack is now at 14.0.7015.1000 (SP2) while the rest of SharePoint 2010 is at 14.0.6029 (SP1). In my opinion, the Configuration Wizard should not have worked, however it did and strangely I was able to create a new Site Collection with a French Template. After it’s done, you should have a dialog like this in the language of your Language Pack. Now if we go in C:\Temp, we will see the extracted language pack! The only difference between this language pack and the RTM language Pack is what’s inside the Updates folder! Notice they are all modified in July 2013… when the SP2 came out! 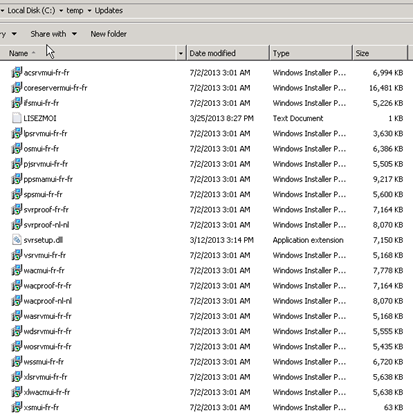 Once you delete those files, you actually have an RTM language pack ready to install. And you will have stuff again in C:\Temp\Updates. (Notice they are all last modified in 2011… you should have no more 2013 there) Now to install the language pack, just run the setup.exe in C:\Temp and then run the Configuration Wizard and the Language Pack will be at SP1 level. 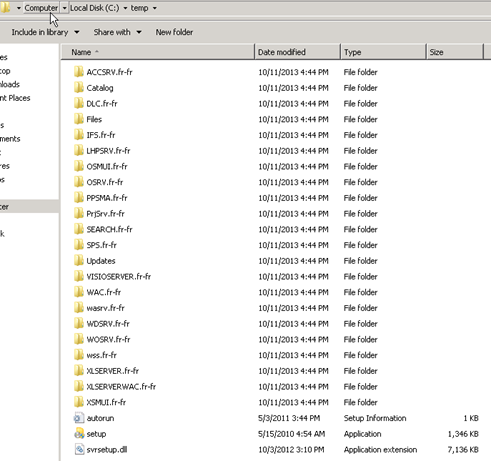 June 13, 2012 SharePoint 2010 and SQL 2012 Could not find stored procedure ‘sp_dboption’. Vlad, you’ve been putting out some awesome posts, and this is no exception! Thank you so much for observing this, and digging into it and publishing a workaround! We’re half way through a SP2 roll up – one environment has it, one does not – and it’s great to know what we might run into if something comes up! Thank you very much for the compliments, it’s really appreciated and I am glad I could help! Your blog posts are amazing as well! Hope to see you at SPC14! I thank you for that solution, facing the drastic withdrawal of SP1 on MSDN . So bad ! Especially for those who want to test a migration of Project Server 2010 before doing it in production ! I had the same feeling : no way to reproduce SP1 farms. Your solution is pretty clever ! thanks for all that !